Not having enough power outlets, USB (Universal Serial Bus) ports, or Data ports can be frustrating specially when trying to meet deadlines. By making use of the Modern 10 Vertical Power and Data Center additional connections will be available for multitasking so that you can complete assignments on time. 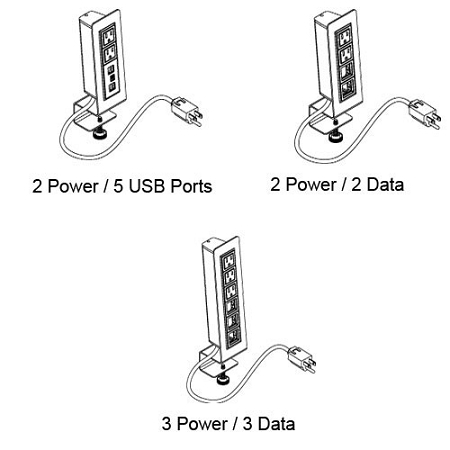 These Power and Data Distribution stations come with power, data, voice, or USB connection ports in a lightweight rectangular frame with an edge mount bracket that fits on surfaces 3/4" to 1 3/4" thick making it easy to attach and remove from any table or desk without cutting holes. 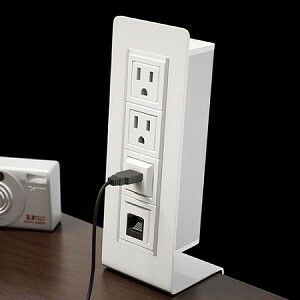 With patented (#7244128B2) water-proof power outlets, there is no need to worry about spills that can cause shock. This connection device comes in gloss black or white with the option of a 72 inch or 120 inch UL (Underwriters Laboratories) Listed power cord. Hospitals, schools, laboratories, and other environments make use of this edge mount power and data center to perform at a higher level. Up to 1 week lead time if not in stock.